This story originally appeared in the Alberta Native Plant Council‘s newsletter, Iris, published November 2014. If a botanist went for a walk in the Lower Athabasca region of Alberta, how likely would it be that he would encounter a rare plant species? How long in kilometres or time would she have to walk to find one? If we could predict the likelihood of finding a rare species in a particular area, would that change where botanists would go for their walk? It’s these types of questions that inspire Dr. Scott Nielsen, associate professor of conservation biology at the University of Alberta and Alberta Biodiversity Monitoring Institute (ABMI) collaborator. Dr. Nielsen is the project lead on the ABMI’s Rare Plants project – designed to fill existing gaps in knowledge of vascular plant distribution in the Lower Athabasca. Map indicating probability of encountering a rare plant species (S1 or S2) in the Lower Athabasca region of Alberta. Red represents areas of higher probability. Credit: Dr. Scott Nielsen. So, how does Dr. Nielsen map the probability of encountering a rare species in the Lower Athabasca? It begins with element occurrence locations of where S1, S2, and S3 plants have been found in the Lower Athabasca, integrating the Alberta Conservation Information Management System (ACIMS) database, lease site information from industry consultants, data from academics, and ABMI’s provincial monitoring dataset. Using these data, Dr. Nielsen selected 21 different rare plant species and modeled their distribution across the Lower Athabasca. Inclusion was based on rarity,2 regional importance and habitat type. Regional importance was defined as at least 20% of species observations in Alberta occurring within the Lower Athabasca region. Habitat type was included to make sure there was a complement of different species with different habitat preferences as many rare plants are habitat specialists. Finally, there had to be enough observations of these focal species to model their distribution. With such requirements, only 21 plants met the initial criteria! The next step was to query the environment preferred by these focal species based on their point locations in GIS using several different landscape measures: habitat was modeled based on the Ducks Unlimited Enhanced Wetland Classification system and was enhanced with surficial geology, climate and a suite of terrain-based indices derived from a digital elevation model (DEM), including terrain wetness, topographic position, and solar radiation. These environmental measures were used to model the plants’ environmental niche and potential distribution (suitable habitat) across the Lower Athabasca. All the models were combined to create a single map highlighting the relative importance of different places for finding the target rare species initially included and hopefully other rare species associated with the sites searched, since all vascular plants are recorded at a site and not simply the target species. Using that map, Dr. Nielsen devised a weighted sampling approach to emphasize places with greater likelihood of encountering rare plants (plots were also allocated to places without predicted rare plants, but at lower intensities). At each site, a 0.25-hectare plot (equivalent in size to a sub-plot used within the ABMI network) is sampled to document presence of all vascular plants using a time-unlimited survey. 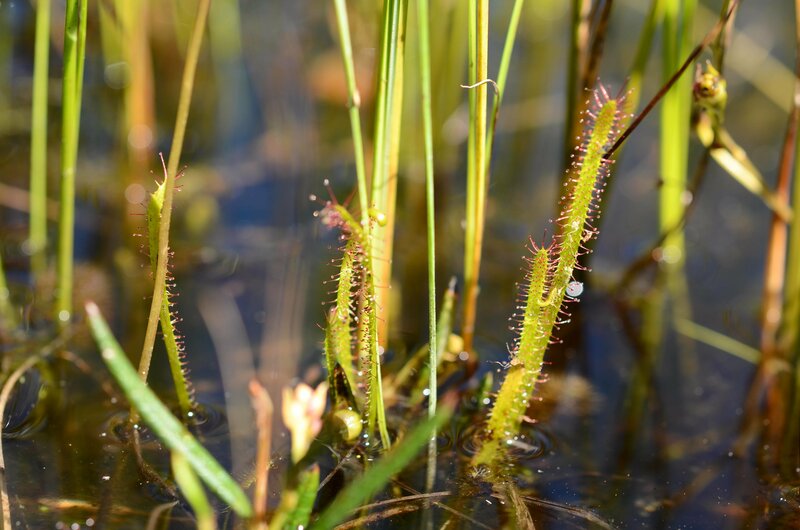 Slenderleaf Sundew (Drosera linearis). Photo: Michel Rapinski. This is an S3-ranked carnivorous inhabitant of fens. 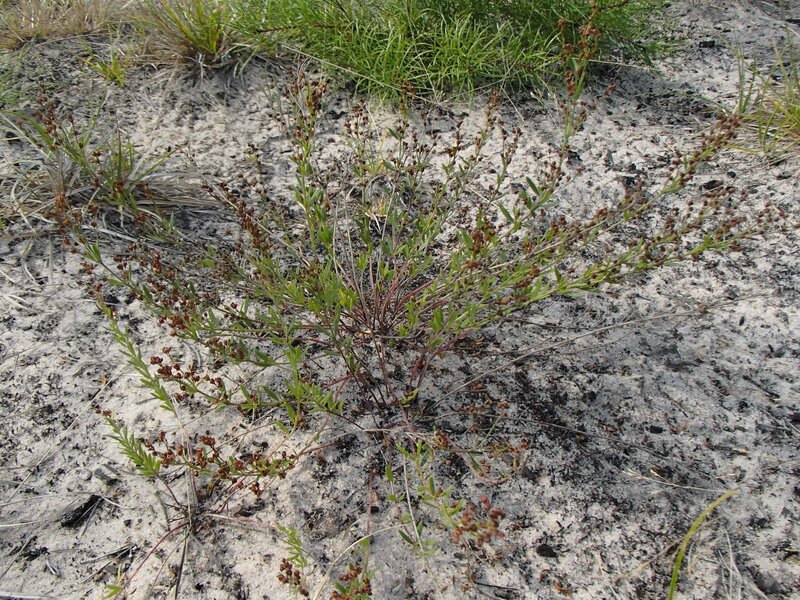 The Rare Plants project collected three records for this species in two years of sampling. The species appears to require consistently wet and open conditions. To ensure general representation of different habitats in the Lower Athabasca, sites were further stratified by the Ducks Unlimited Enhanced Wetland classification covering graminoid fens, shrubby fens, treed fens, treed bogs, pine forests, etc. While lacking the detail of ecosite mapping on leases, the advantage of this classification system was that it could be used across the entire region being modeled. Each Ducks Unlimited habitat type was allocated plots for sampling based on likelihood of encountering the target species (with more plots in areas identified as having greater probability of encountering rare plants). The advantage of the targeted (model-based) system is that it allows for increased sampling effort in rare habitat types, while reducing effort spent sampling more common habitats or environments where rarity is less likely. Because the model-based approach works best for species that are habitat specialists, it’s likely that some non-habitat specialists may not be covered by the approach. 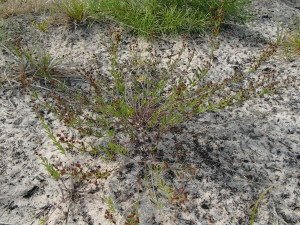 However, the sites are still able to provide general rates of rarity, or encounters, for those plants that aren’t closely associated with a particular habitat type (e.g. Botrychium). Pinweed (Lechea intermedia). Photo: Jacqueline Dennett. The results so far have pleasantly surprised Dr. Nielsen: “the model has shown good predictive capacity, backed up by what we’ve encountered in the field – we are getting better at predicting the probability of encountering an S1 or S2 plant, understanding environmental drivers of rarity, and attaching probabilities of occurrence of S1 and S2 plants for each habitat type.” The model was field tested in 2012 and 2013, resulting in 51 new detections for 16 of the target rare plant species. Certain terrain variables appear to predict patterns of rarity. In particular Nielsen is finding that topographic position index (derived using a DEM) correlates with some rare plant occurrences and may relate to its effects on microsite conditions important to rare plant species. Dr. Nielsen and his team have just finished their 2014 field season and have now visited 520 plots in the Lower Athabasca. Lead botanists Jacqueline Dennett and Tim Chipchar have spent the past few field seasons sampling plots in the region, meaning that, with more data, the project is able to use the locations Dennett and Chipchar have sampled, instead of prior plant location data. The project is now modeling the possibility of encountering a S1 or S2 plant using a larger, stratified random dataset, which allows for improved predictions across broader regions of the Lower Athabasca. 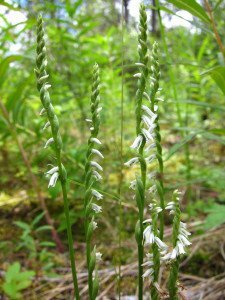 Northern Slender Ladies-Tresses (Spiranthes lacera). Photo: Tim Chipchar. This is an S1-ranked small orchid species that was observed in the 2013 season from a site north-east of McLelland Lake. This adaptive sampling approach results in a continuous refinement of the model where new data feeds into the model and improves the predictions of hotspots of rarity. Rather than a lease-by-lease scale, Dr. Nielsen’s mapping allows for broad, regional assessments of rarity that can inform land-use planning and pre-disturbance assessments. Nielsen emphasizes that regional mapping of rare plants is not meant as a replacement for local meander-based surveys or for the provincial grid monitoring done by the ABMI. In fact, Nielsen’s team is also completing meander plots and in particular focusing on measuring survey effort by tracking their meander paths. The idea is to measure the probability of detecting a rare plant per kilometer or per unit time by habitat or even local terrain using detailed remote sensing data. In this way, Nielsen sees the rare plant sampling work they are doing as complementary to both ABMI plot-based efforts and ANPC meander protocols. 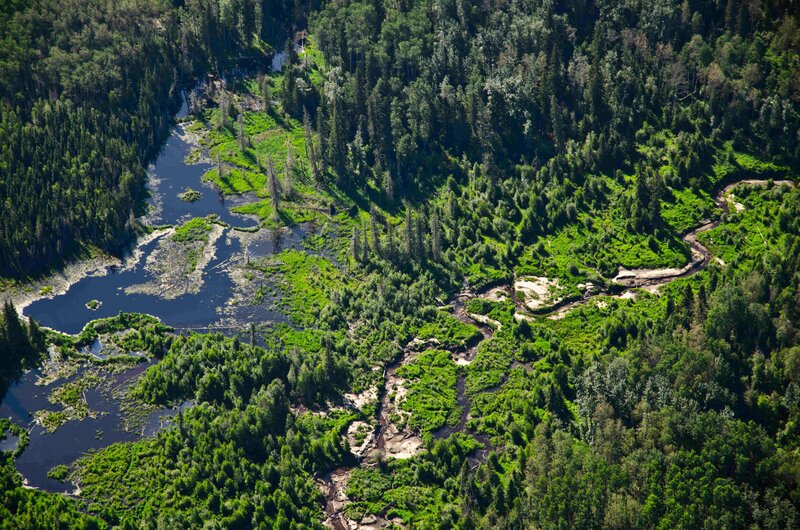 A critical information gap in regional planning is the lack of spatial-contiguous sources of information identifying sites across the Lower Athabasca with potential rare plant habitat. This work helps fill that gap by providing a regional map of rarity and listing of rarity by habitat. Moving forward, the team hopes to continue to improve the understanding of rare plants across the Lower Athabasca region through additional sampling and integration with ABMI’s core monitoring program. The team is also working to compare and incorporate meander-based data into the existing plot-based models and begin to explore more specific management questions such as success of mitigation options, and indirect effects of development on rare plants. Enough to keep the Rare Plants team busy for some time to come! The ABMI and the Devonian Botanic Garden are hosting a Rare Plants Identification course in July – find out more here! Top photo: Looking over Fort McMurray area. Photo: Michel Rapinski. 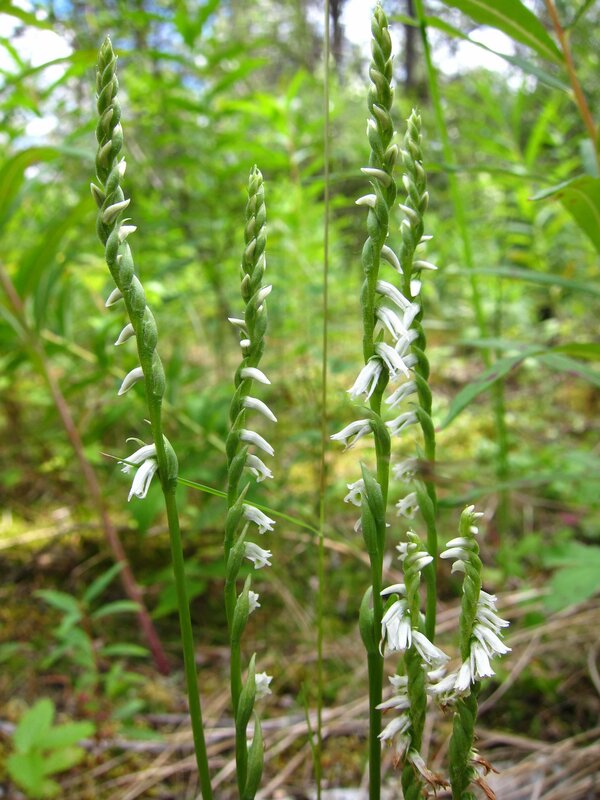 The ABMI’s Rare Plants project was originally conceived and initiated through the Ecological Monitoring Committee for the Lower Athabasca (EMCLA). The ECMLA, a consortium of oil sands companies, government ministries, and agencies coordinated by the ABMI, was established in 2010 with the goal of designing protocols to monitor rare and elusive species. We considered species to be rare if they were classified in 2011 as S1 (critically imperiled), S2 (imperiled), or S3 (vulnerable), according to NatureServe Canada. Note that S3 species are no longer used in predicting regional hotspots of rarity, as many are more common in the Lower Athabasca region than their S3 rank suggests.